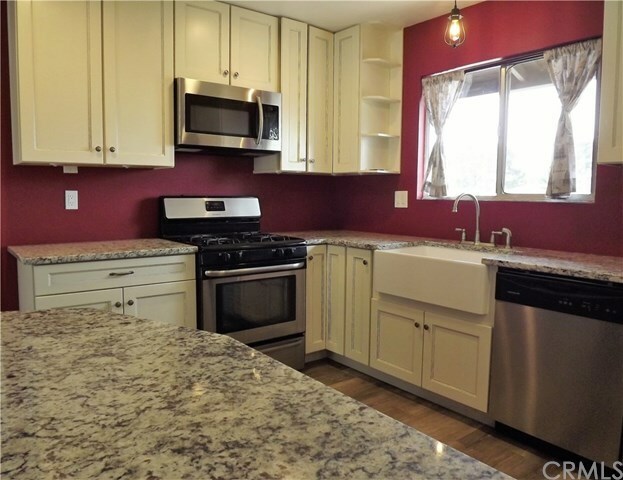 Desirable Orcutt area - 4 bedrooms 2 baths and a totally remodeled kitchen. Kitchen has stainless steel appliances (refrigerator, range/oven, microwave and dishwasher) Cabinets are custom and self closing drawers beautifully painted. Oversized granite island allows seating all around. Granite counter tops in kitchen. Gray and white counters match the new laminate gray wood look floors. New oversized baseboards. Recessed lighting in kitchen and living area. Bathroom has new vanity and mirror - new toilets - new industrial tile - other bathroom has pedestal sink. Home is walking distance to shopping, schools, banks and grocery store, etc. Home offers a free standing storage/hobby shed on concrete slab.